India’s second largest car manufacturer, Hyundai is set to launch their new Creta compact SUV on July 21 this year. 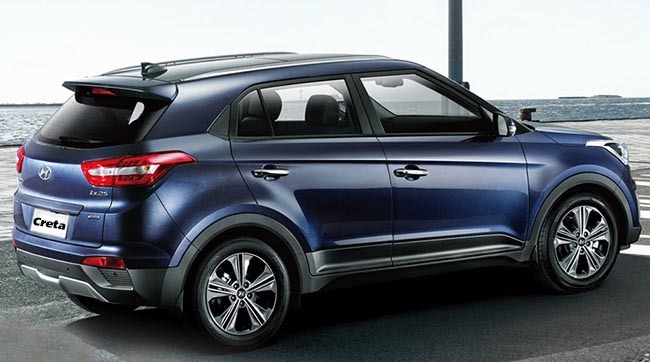 Hyundai Creta, – the official name was revealed earlier this month, was previously known as Hyundai iX25. The new small SUV Creta would take on the likings of its competitors like Renault Duster as well as the upcoming Maruti S-Cross(which is expected to revealed by next month). South Korean auto giant, Hyundai has good amount of expectations from the new Creta. Creta could further enhance the company’s position in Indian car market, where there is a huge popularity for SUVs. The all new Creta was first expected to be launched in the month of August, because of the arrival of Maruti S-Cross in July, Hyundai had to reschedule the SUV launch to keep the game much closer. The company has released official design sketches of the upcoming small SUV as a teaser, giving a clear idea on what should customers expect from new Creta. When it comes to the styling, Hyundai Creta has a full black body cladding with faux scuff plates, hexagonal grille which most likely would receive chrome treatment on Creta’s production version. Sketches revealed so far also shows up angular headlamps with LED elements with twin-projector units, robust well looking front and rear bumpers, 17 or 18-inch alloy wheels, neatly styled tail-lamps. New Creta is expected to offer 200mm of ground clearance. Talking about the exterior of the car, Creta is expected to gain color co-ordinated dashboards depending on the variant with the design sketches showing a dual tone dashboard with similar color inserts carrying even on the doors. 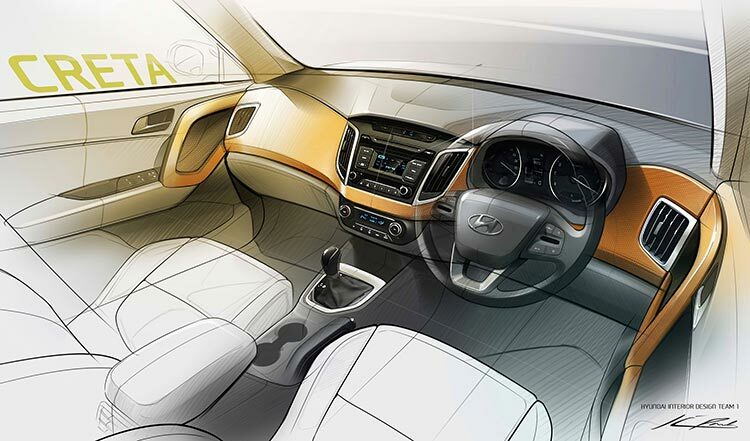 As per the revealed sketches, the centre console in the seems to get a media system which is similar to the one in Hyundai Elite i20 flanked by vertical air-con vents with silver surround. It would be great,if this unit would be replaced by a touchscreen unit in the top variant. The car gets the familiar climate control switch-gear as seen on its siblings. The multi-function steering is as well similar to the one in Elite i20. The instrument cluster in the car consists of traditional dials that are very easy to read. Hyundai Creta cab also gets twin cupholders which are placed besides the hand brake between front seats and a central arm-rest along with rear air conditioning vents. Newer additions in the Creta are the push button start, Bluetooth telephony controls on the car steering. ABS and dual airbags serve as the safety features for the car. Hyundai’s upcoming small SUV Creta is going to be powered by Hyundai’s 1.6 litre diesel engine that could churn out a maximum power of 126bhp and 26.5kgm of peak torque. The power is transmitted to the wheels through a 6-speed manual as well as automatic gearbox. You can also expect the 1.6 litre petrol engine with 121bhp of power in the future. As of now, There are no official details on the price of new Hyundai Creta. We hope it would be priced competitively to woo customers in compact SUV segment. Also read: What to expect from Hyundai Creta in India? Honda's upcoming compact SUV to be called as Honda BR-V?